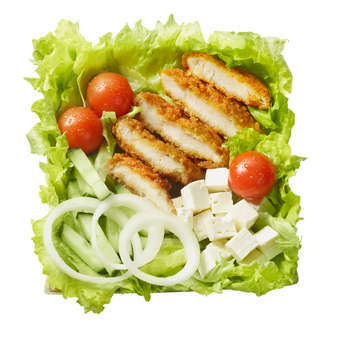 Warm, crispy fried chicken fillet, Greek-style cheese cubes, fresh onion, cherry tomatoes, fresh cucumbers and crisp iceberg salad – oh yeah! The salad comes with your choice of salad dressing and seed mix or croutons. It doesn't get any better than this.